Reference number for this case: 19-Oct-54-Montlandon. Thank you for including this reference number in any correspondence with me regarding this case. The only information about this alleged observation of the "close encounter of the third kind" type comes from an article of the regional newspaper Le Haut Marnais Républicain for October 29, 1954, found in press archives by the ufology group 5255 who published it in their semiannual No. 1 in February 1980. The article said that "some ten days ago" - hence the approximate date of October 19, 1954 - a girl from Montlandon, "G.", 14, would have seen a flying saucer, "or at least a mysterious craft," land a few tens of meters from her while she kept cows in a field quite far in the countryside. It was about noon, the craft was disk-shaped, flying close to her, landing, and rolling to the nearby corner of wood, before rising again into the air. It is said that a man dressed in a sort of white cassock was piloting the saucer. The gendarmerie of Langres, informed, reportedly proceeded to an investigation, and reportedly noted no contradiction in the story of the girl "who did see something." The investigators did not find any traces on the landing site. The "most complete secret had hitherto been kept on this affair but in our villages all ends up being known by everyone and the inhabitants of Montlandon wonder what is the strange craft which has chosen the territory of their commune to land." Approximately ten days ago, a young girl of Montlandon, G., aged 14, is said to have seen a saucer, or at least a mysterious machine, which landed at a few tens of meters of her. The child kept the cows in a field rather far away from the country when she saw, about midday, an apparatus in the shape of a disc, flying not far from her, which landed and rolled up to the edge of the very close wood, before rising again in the air. A man equipped with a kind of white cassock controlled the saucer. The informed gendarmerie of Langres is said to have proceeded with an investigation. No contradiction is said to have been found in the account of the young girl who is said to really have seen something. The research of the investigators did not manage to find traces on the spot of the landing. The most complete secrecy had been held up to now on this affair but in our villages all ends up being known and the inhabitants of Montlandon do wonder what the strange apparatus which chose the territory of their commune to land is. About ten days ago, a little girl from Montlandon, 14-year-old G..., would have seen a saucer or at least a mysterious craft land a few tens of meters from her. The child was keeping the cows in a field quite far away in the country, when she saw, towards midday, a device in the shape of a disc flying not far from her; which landed then drove to the horn of the very close wood, before rising again in the air. A man dressed in a sort of white cassock was driving the saucer. The gendarmerie of Langres, warned, reportedly made an investigation. No contradiction was reportedly found in the story of the girl who did see something. The investigations of the investigators did not reveal traces on the landing sites. The most complete secret had hitherto been kept on this affair, but in our villages all ends up being known by everyone and the inhabitants of Montlandon wonder what strange apparatus could have chosen the territory of their commune as landing ground. Montlandon around October 19, 1954, around noon. Ten days ago, a little girl from Montlandon, little G., aged 14, reportedly saw a saucer, or at least a mysterious craft, land a few dozen meters from her. The child was keeping the cows in a field quite far in the country when she saw, around noon, a disc-shaped craft, flying not far from her, which landed and drove to the horn of the nearby wood, before rising again in the air. A man dressed in a sort of white cassock was driving the saucer. The gendarmerie of Langres, alerted, reportedly conducted an investigation. No contradiction was reportedly found in the story of the girl who did see something. Investigations by the investigators did not reveal traces at the landing site. The most complete secret had hitherto been kept on this affair but in our villages all ends up being known by everyone and the inhabitants of Montlandon wonder what is the strange apparatus that chose the territory of their commune to land. Le Haut Marnais Républicain for October 20, 1954. October 19, 1954 in Montlandon (52). A few days after Neuilly-l'Evêque, it is a girl of Montlandon, little G., aged 14, who reportedly saw a saucer, or at least a mysterious craft, a few tens of meters of her. The child keeps the cows in a field quite far in the country, when she sees, around noon, a craft in the shape of a flying disc which lands not far from her then rolls to the horn of a very close wood, before rising again in the air. A man dressed in a sort of white cassock pilots the saucer. The gendarmerie of Langres, informed, carried out an investigation. No contradiction was found in the story of the girl who did see something. Investigations by the investigators did not reveal traces at the landing site. (Ref. : Magazine #2 of the Group 52 55 according to the Haut Marnais Républicain for 10/29/54). The magazine reproduces the article in [hm1]. 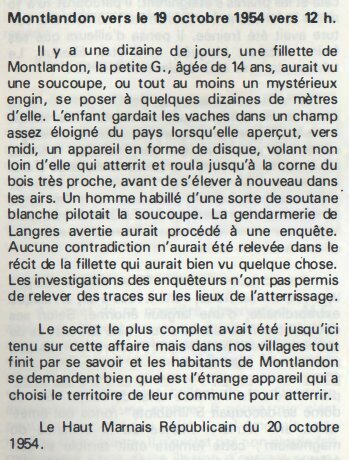 On Tuesday, October 24, 1954, (a few days after case #11 in the same region), it was a girl from Montlandon (52), the little G ... (14-year-old) who reportedly saw a flying saucer, or at least a mysterious craft, land a few tens of meters from her. The child keeps the cows in a field quite far in the country, when she sees, towards noon, a device in the shape of a flying disk which lands not far from her then rolls until the corner of a very close wood, before rising again in the air. A man dressed in a sort of white cassock pilots the saucer. The gendarmerie of Langres, informed, carried out an investigation. No contradiction was found in the story of the girl who did see something. The investigations of the investigators did not reveal traces on the premises of the landing. Explanation: would this still be a mistake with a helicopter and its pilot? In these 2 cases the "saucer" slides and rolls on the ground. Source: magazine #1 of the GROUP 5255 citing the Haut Marnais Républicain for 10/29/1954. "About ten days ago, a 14-year-old girl from Montlandon, little G..., reportedly saw a saucer, or at least a mysterious craft, land a few meters away from her. The child was keeping the cows in a field quite far in the country, when she saw, around noon, a disc-shaped craft flying close to her, which landed, then rolled to the horn of a very close wood, before rising again in the air. According to the child, a man dressed in a sort of white cassock was driving the saucer. The gendarmerie of Langres reportedly carried out an investigation. No contradiction was reportedly revealed in the declarations of the girl who did see something. Investigations by the investigators did not reveal traces of the landing site. The most complete secret had hitherto been kept on this affair, but in our villages everything ends up being known and the inhabitants of Montlandon are wondering what strange craft could have chosen the territory of their commune as a landing-ground." 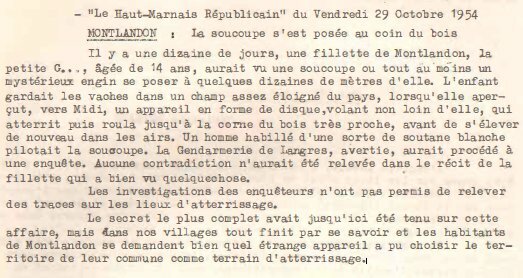 Jean Sider indicates that the local source is Le Haut-Marnais Républicain, of Chaumont, for October 20, 1954, page 4. Raoul Robé comments this case as presented by Jean Sider ([js1]) in his 1997 book. In the case of Montlandon (52) of October 19 he [Jean Sider] brings nothing more than the press of the time. A 14-year old girl reported seeing a strange disc-shaped object descend and land on a field next to some woods. A man dressed in a sort of white cassock or smock was seen briefly onboard the object. The craft immediately took off again and disappeared from sight. 1954 - At noon 70 people in the city of Amiens, Somme, France saw a fiery object spinning high in sky, shooting out green beams of light. Also, at the same time in Montandon [sic], Haute-Marne, France a teenager saw a saucer-shaped object land by some woods near a pasture. A man wearing a white spacesuit exited the craft. His report was investigated by the police. (Sources: Lumieres dans la Nuit, issues # 321 & 260). 1954 - A 14-year-old girl in Montlandon, France reported seeing a strange disc-shaped object descend and land in a field next to some woods. A man dressed in a sort of white cassock or smock was seen briefly onboard the object. The craft immediately took off again and disappeared from sight. (Source: Albert S. Rosales, Humanoid Contact Database 1954, citing Raoul Robe, Regional Catalogue). Luc Chastan indicates that in the Haute Marne in Montlandon on October 19, 1954 at 12:00 hours "a young girl of Montlandon, 14 years old, reportedly saw an object, land within a few tens of meters of her. The child was keeping the cows in a field rather far away from the country when she saw, about midday, an apparatus in the shape of a disc, flying not far from her which lands and rolled to the horn of very close wood, before rising again in the airs. A man dressed in a kind of white cassock controlled the saucer. The alerted gendarmerie of Langres is said to have proceeded to an investigation." The website indicates that on 19 October 1954 at 12:00 in Montandon [sic], France "Saucer lands by woods near pasture. Man wearing white spacesuit exits. Police investigation." And: "Close encounter with an unidentified craft and its occupants. One disc was observed by one male teenage witness in a pasture for over one minute. One humanoid, wearing a white spacesuit, was seen." The source is indicated as "Hatch, Larry, *U* computer database, Author, Redwood City, 2002." Summary: A 14-year old girl reported seeing a strange disc-shaped object descend and land on a field next to some woods. A man dressed in a sort of white cassock or smock was seen briefly onboard the object. The craft immediately took off again and disappeared from sight. *Oct. 19, 1954 - A 14-year-old girl in Montlandon, France reported seeing a strange disc-shaped object descend and land in a field next to some woods. A man dressed in a sort of white cassock or smock was seen briefly onboard the object. The craft immediately took off again and disappeared from sight. (Source: Albert S. Rosales, Humanoid Contact Database 1954, citing Raoul Robe, Regional Catalogue). The author indicates that there was a close encounter of the third kind in Montlandon, the Haute-Marne, on October 19, 1954, at noon. Miss G, an anonymous 14-year-old, kept the cows in a field quite far in the country, when she saw a flying disc-shaped craft not far from her, landed, then rolling to the horn of a very close wood, before rising again in the air. According to the child, a man dressed in a sort of white cassock was driving the saucer. The gendarmerie of Langres would have carried out an investigation. No contradiction would have been found in the statements of the girl who did see something. The investigations of the investigators did not reveal traces on the landing site. The author gives as sources Le Haut-Marnais Républicain (Chaumont) for October 20, 1954; and Jean Sider, Le dossier 1954 et l'imposture rationaliste, page 211. Montlandon as a municipality of the Haute-Marne no longer exists since 1972: the village was associated with Hortes, Troischamps and Rosoy-sur-Amance, the gathering forming the commune of Haute-Amance. The date "October 19, 1954" was assigned by the ufology group 5255 and based on the date of publication of the newspaper article on October 29, 1954, and its mention that it had occurred "about ten days ago". It is therefore an approximate date. After Fernand Lagarde's version, almost everyone, except CNEGU, give a wrong date for the newspaper article. It is on October 29, 1954, but for Figuet it becomes October 18, 1954; and for almost everyone it becomes "October 20, 1954" with the case at "October 19, 1954" although it would then no more be "some ten days ago"! The press version is very poor as for the description of "the craft" since there is simply none. It may very well be that the girl did not call it a saucer or a disc, that this was an interpretation by adults. The newspaper shows the hesitation on this matter: "a saucer, or at least a mysterious craft". The pilot is described only as a man dressed in a kind of white cassock piloting the saucer, seen from "a few tens of meters". So he is probably a human, not an extraterrestrial being. A crucial point is the mention that after landing, the machine rolled and then took off again. A helicopter does not do that, a car does not do that. I think this especially indicates that the press story is neither complete nor precise. One can therefore hesitate between a landing and departure of helicopter and a passage of some motor vehicle - the case of Orchamps-Vennes of October 12, 1954, is one of the examples of an automobile which "takes off" and gets called a "flying saucer". The possible report of the gendarmerie of Langres has not been published to date; it is likely that better information, and the solution, may be in there. [hm1] Article in the regional newspaper Le Haut Marnais Républicain, Chaumont, France, page 4, October 29, 1954. [hm1] (Possible) Gendarmerie Nationale report, Langres brigade, 1954. Article in the ufology bulletin GROUPE 52 55, of the Groupe d'Etude sur les OVNI Haute-Marne / Meuse, bi-annual #1, February 1980. [fl1] "De l'inédit dans nos archives de 1954 et 1956", article by Fernand Lagarde, in the ufology magazine Lumières Dans La Nuit (LDLN), France, N° 259-260, page 43, janvier - février 1986. [ld1] Ufology magazine Lumières dans la Nuit (LDLN), France, #259-260, page 43, January/February 1986. [mf1] "Additifs à Francat", list by Michel Figuet, in the ufology magazine Lumières Dans La Nuit (LDLN), France, #263-264, page 21, May / June 1986. [cn1] "Liste des Cas d'Humanoïdes sur le N-E", catalogue the GNEGU and the GPUN ufology groups, in the ufology magazine Lumières Dans La Nuit (LDLN), France, #267-268, pages 38,41-42, September / October 1986. [---] Aticle by Jean Sider, in the ufology magazine Lumières dans la Nuit (LDLN), France, #321, 1994. [cn2] "Catalogue Régional d'Observations d'Humanoïdes - 3ème édition", in the annual ufology magazine Les Mystères de l'Est, CNEGU, France, #1, page 6, 1995. [js1] "Le Dossier 1954 et l'Imposture Rationaliste", book by Jean Sider, Ramuel publisher, France, page 211, 1997. [cn3] "Réponse des "débunkers de l'Est" à Jean Sider", article by Raoul Robé, in the annualy ufology magazine Les Mystères de l'Est, CNEGU, France, page 143, 1998. [gz1] "RR3 - Le Dossier des Rencontres du Troisième Type en France", book by Julien Gonzalez, Le Temps Présent publishers, France, pp 149-150, 2014. 0.1 Patrick Gross February 25, 2007 First published. 1.0 Patrick Gross January 4, 2010 Conversion from HTML to XHTML Strict. First formal version. Additions [dj1], [dj2], [lc1], [ud1]. 1.2 Patrick Gross October 9, 2014 Addition [ta1]. 1.3 Patrick Gross October 18, 2014 Addition [ni1]. 1.4 Patrick Gross January 10, 2019 Additions [lh1], , [fl1], [cn1], [cn2], [js1], [cn3], [gz1], Summary. Explanations changed, were "Not looked for yet." This page was last updated on January 10, 2019.